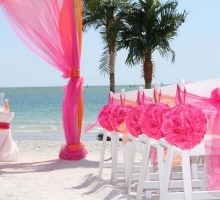 Wow - when two colors look this good together, they are a thrilling backdrop for your special day. 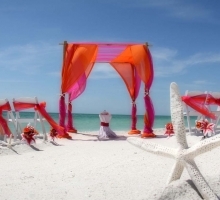 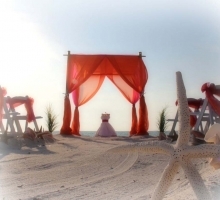 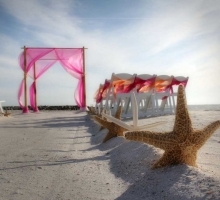 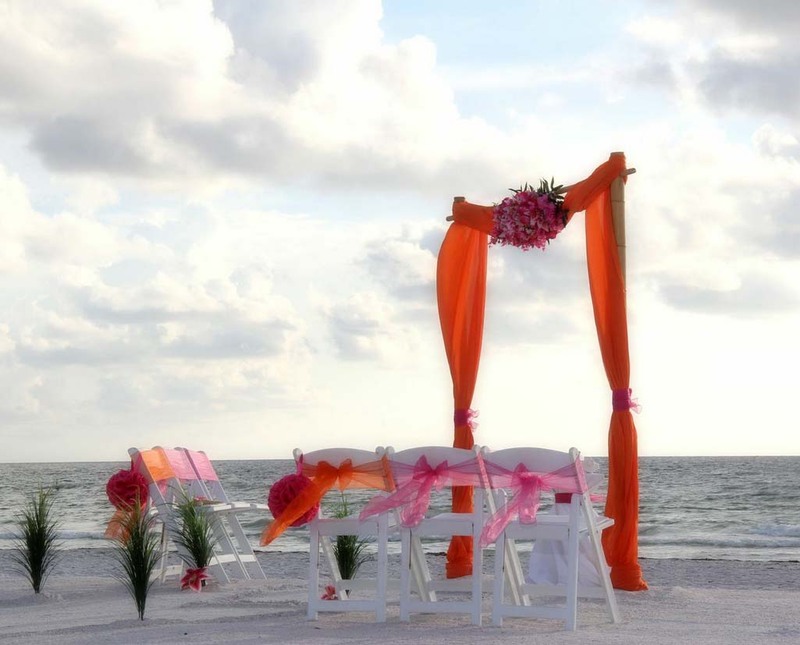 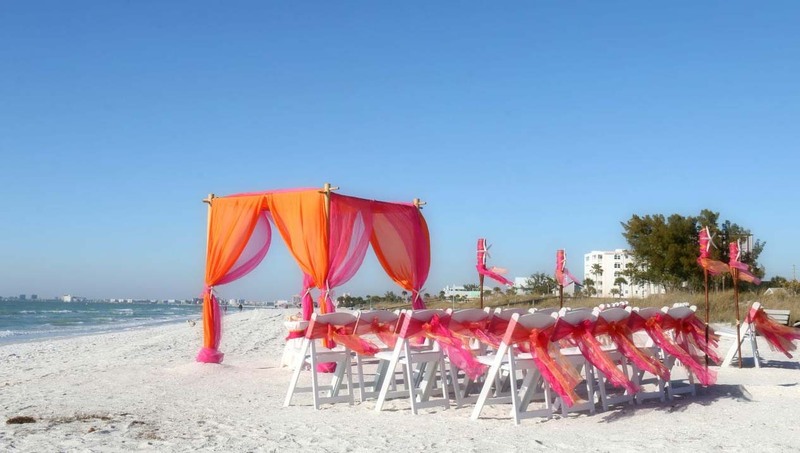 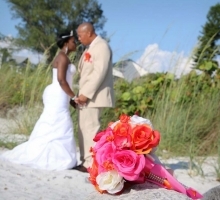 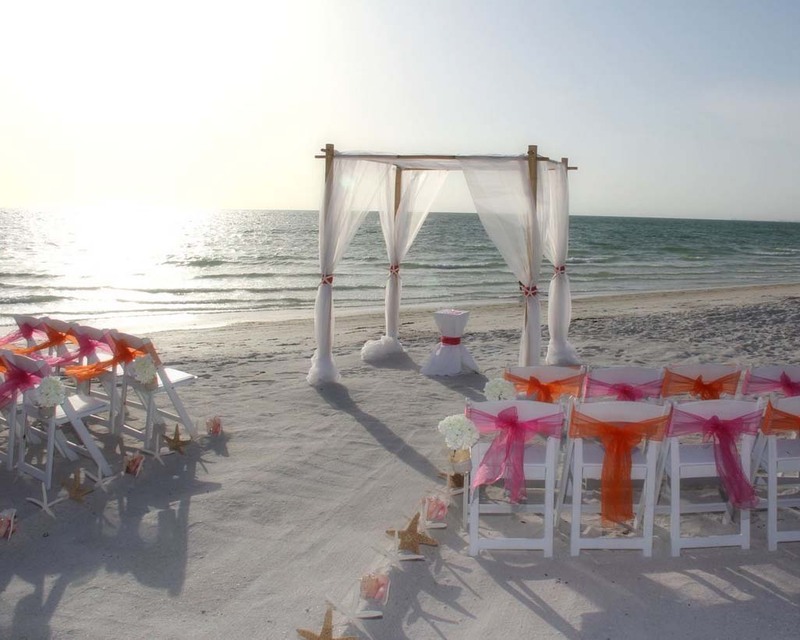 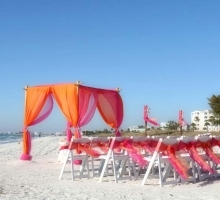 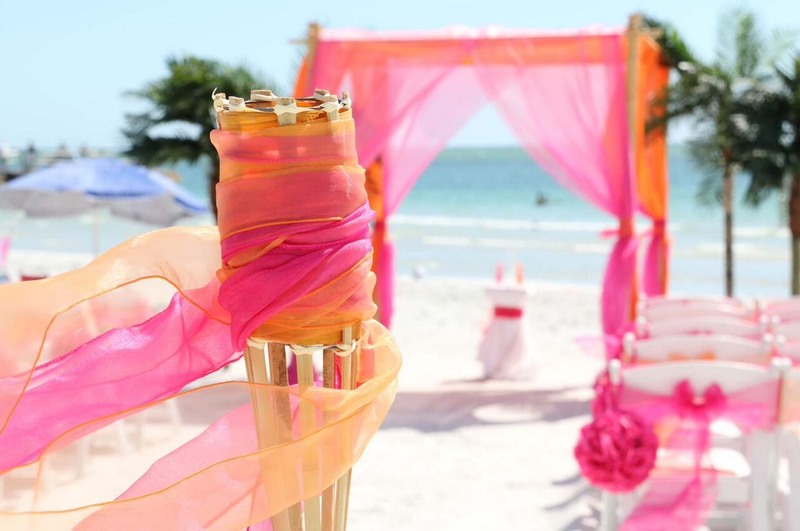 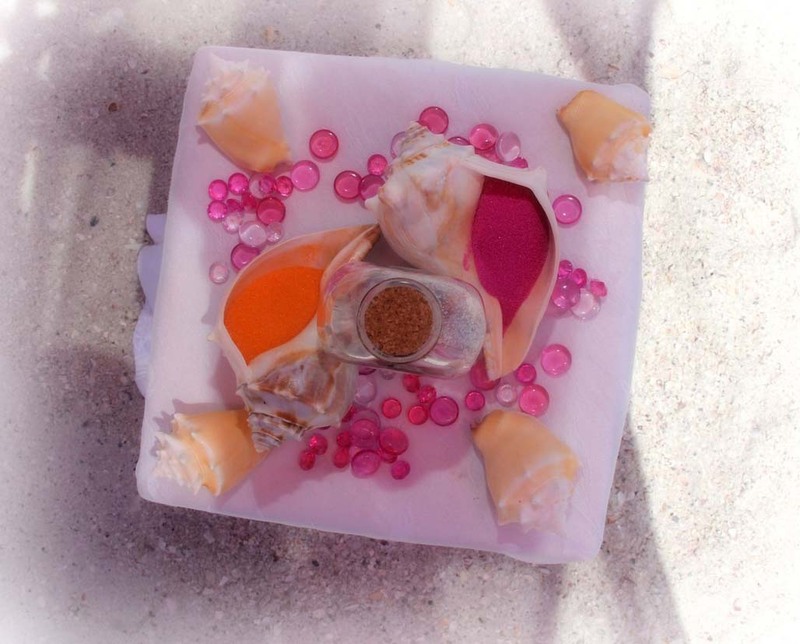 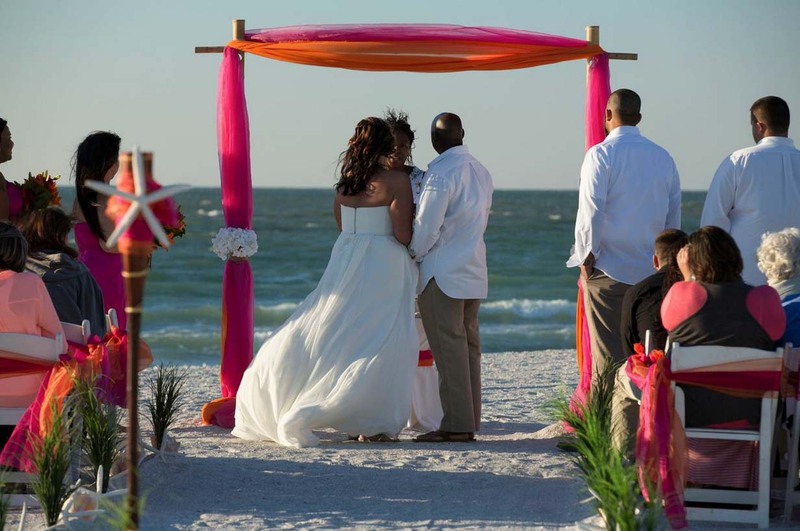 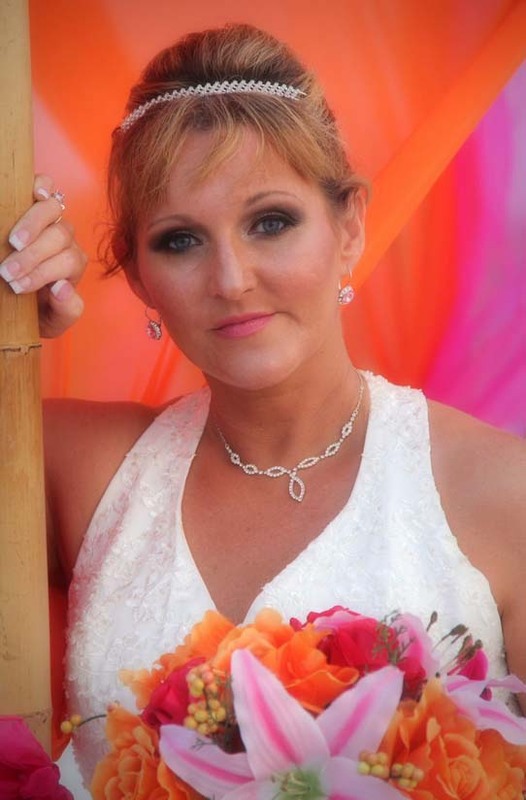 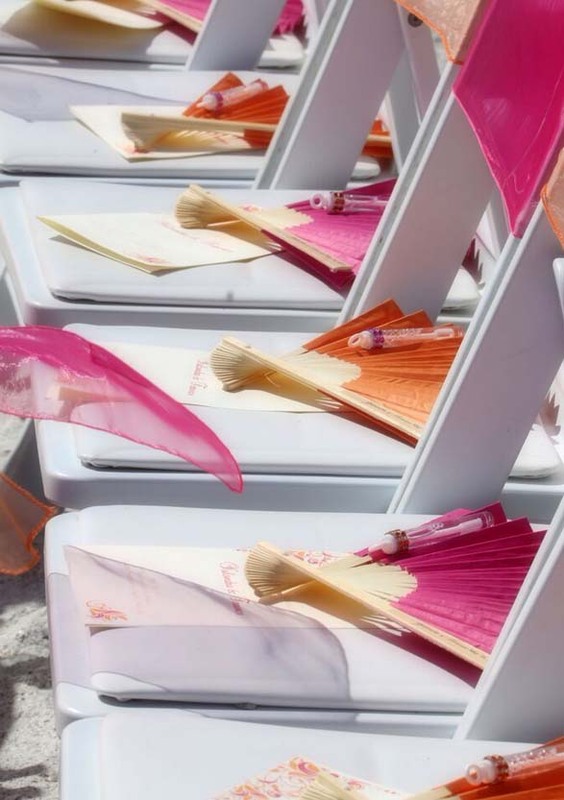 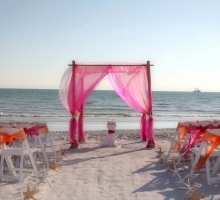 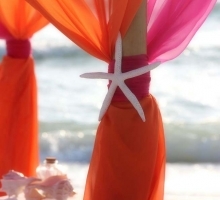 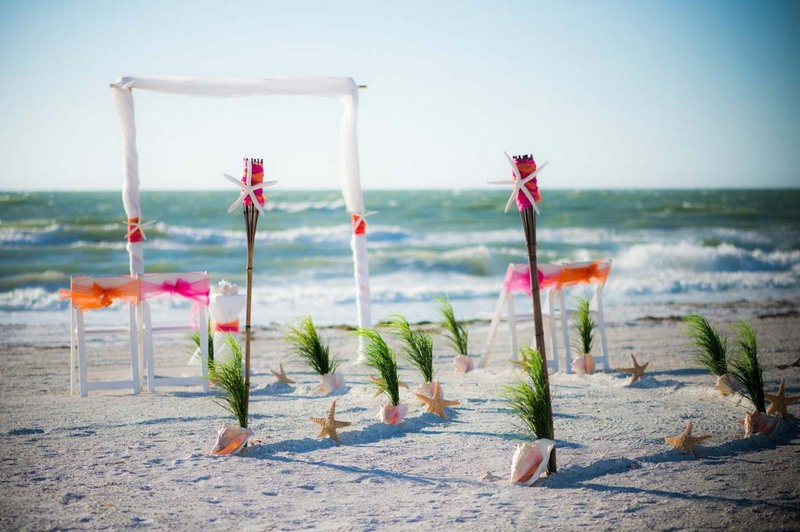 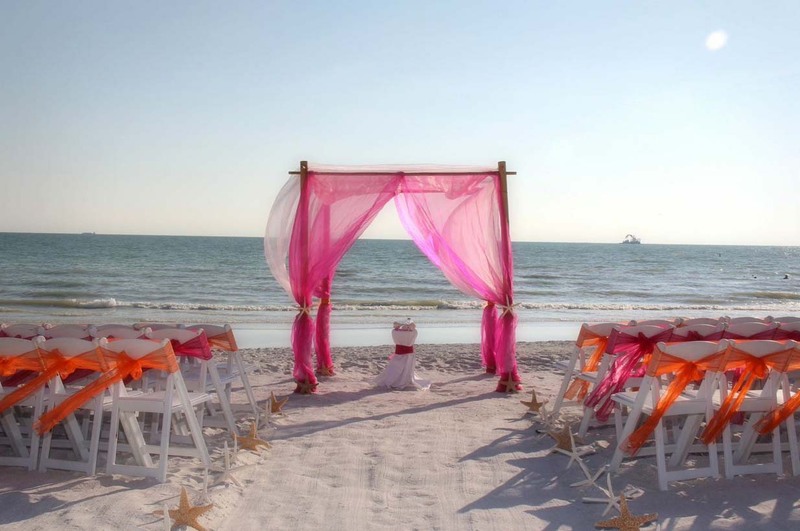 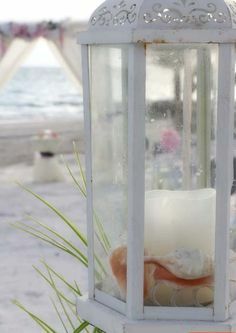 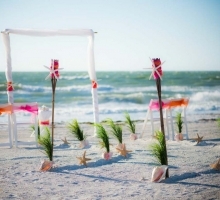 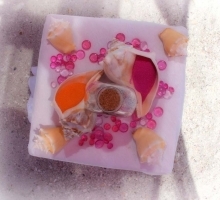 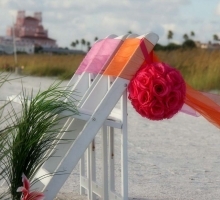 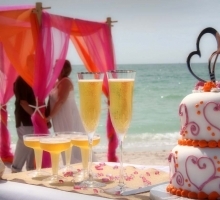 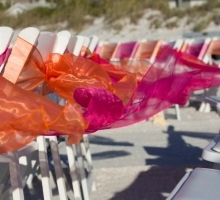 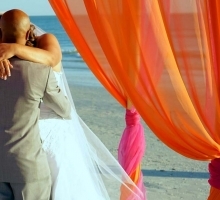 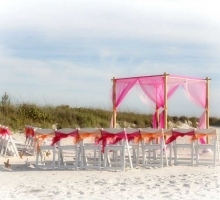 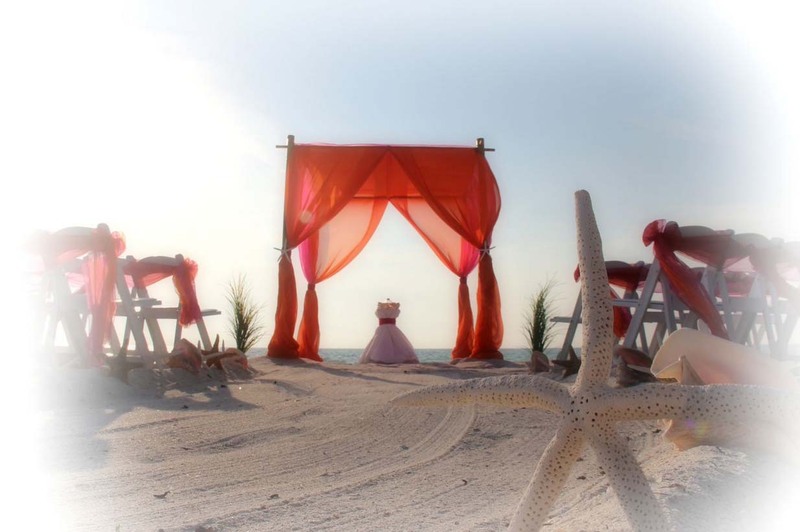 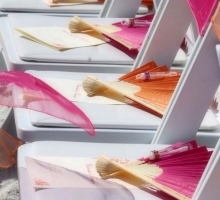 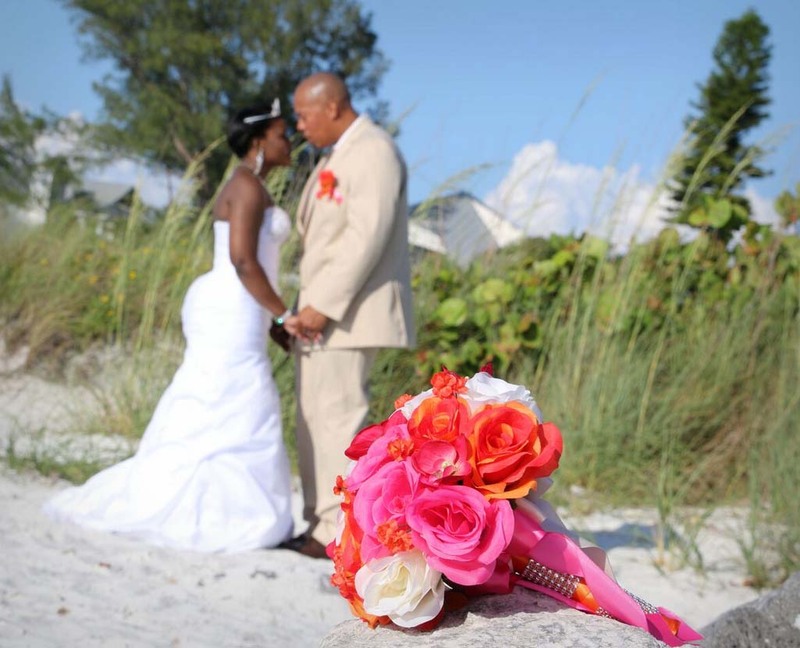 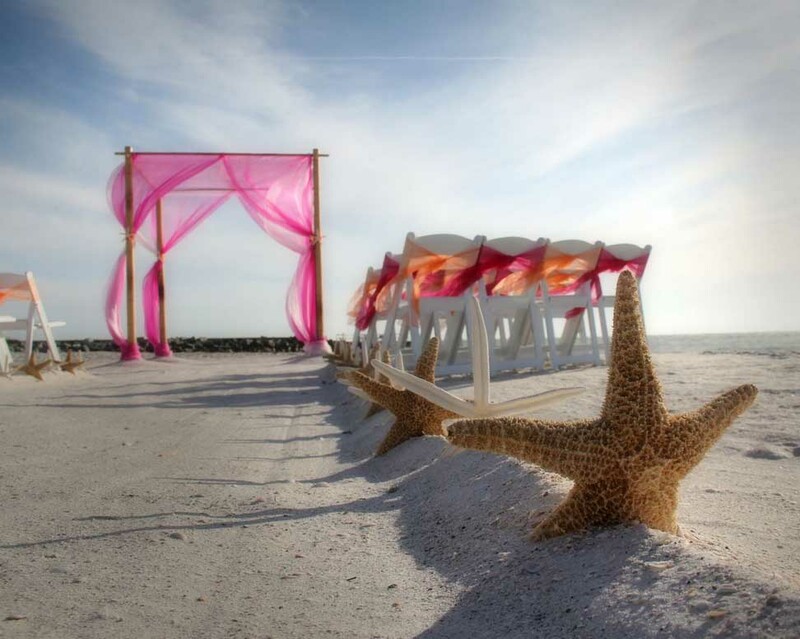 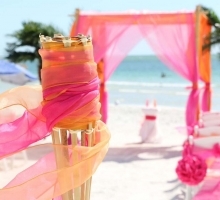 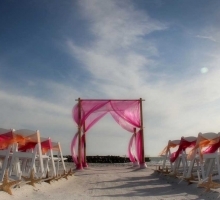 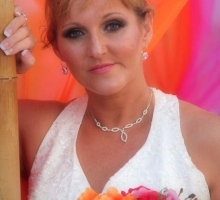 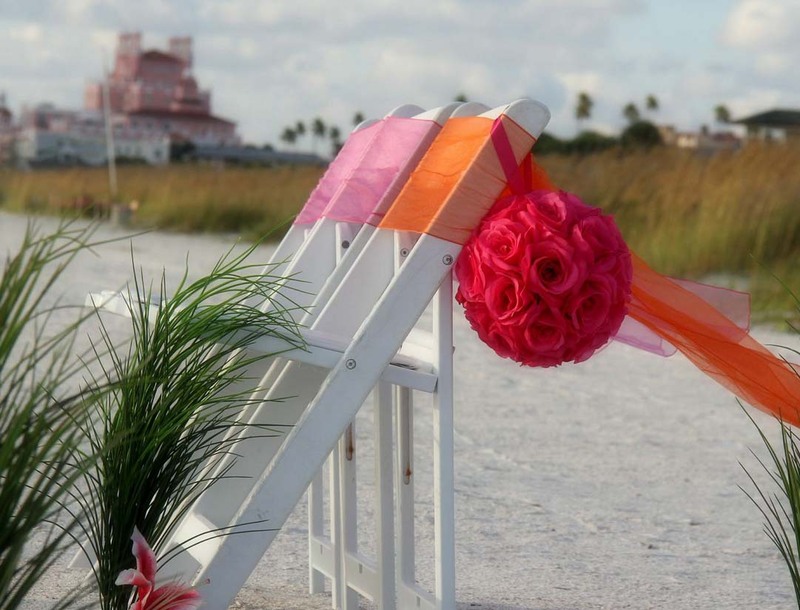 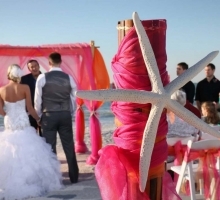 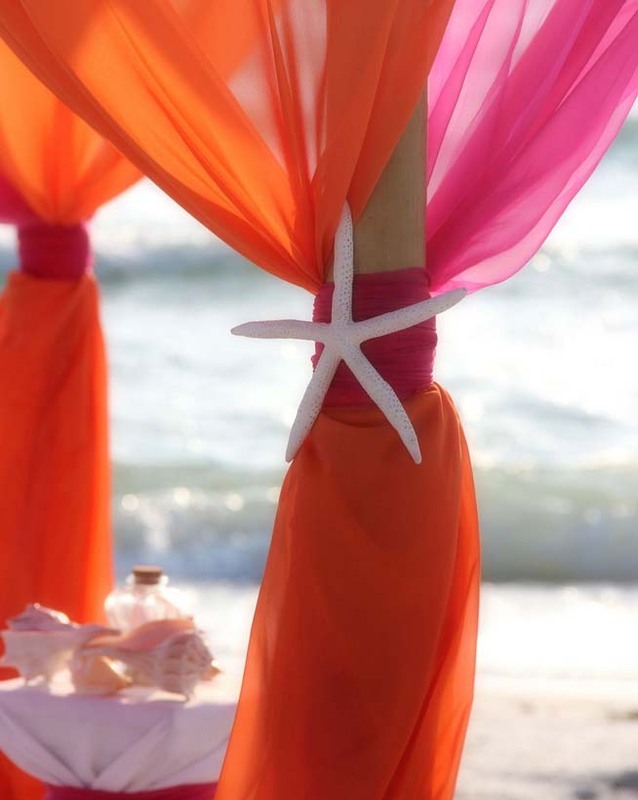 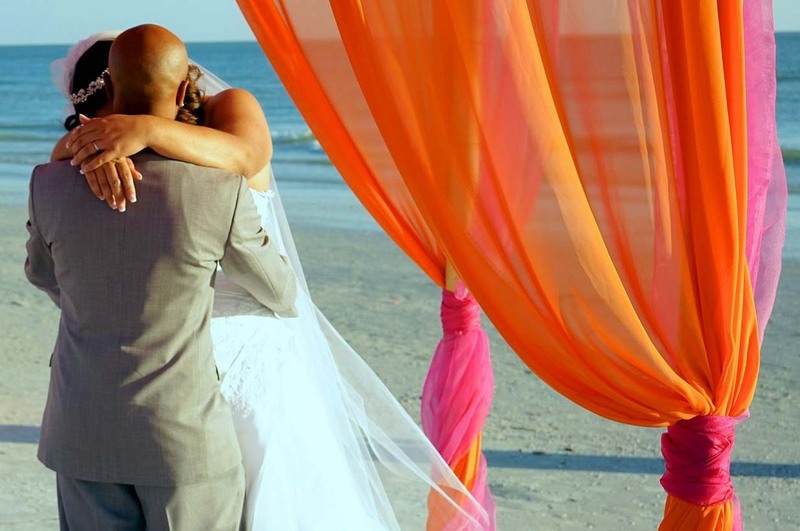 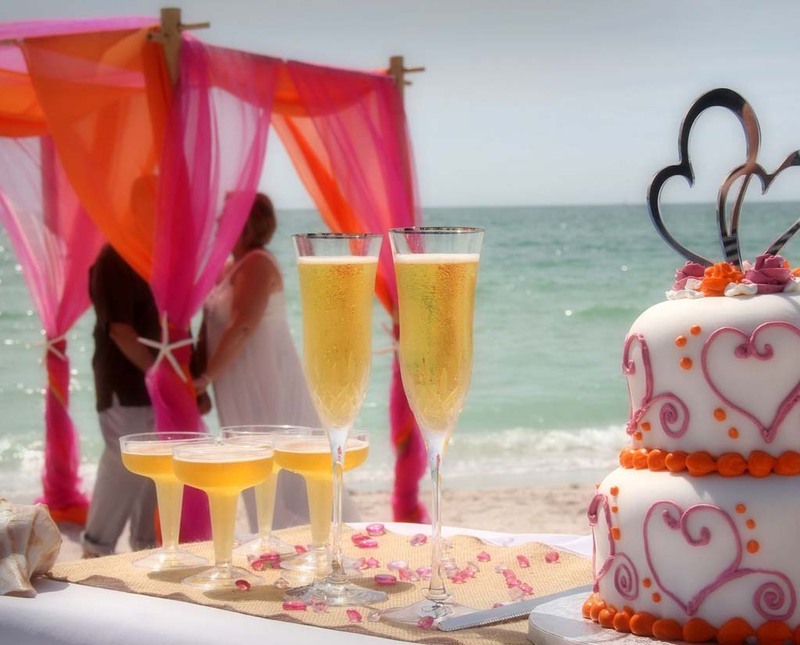 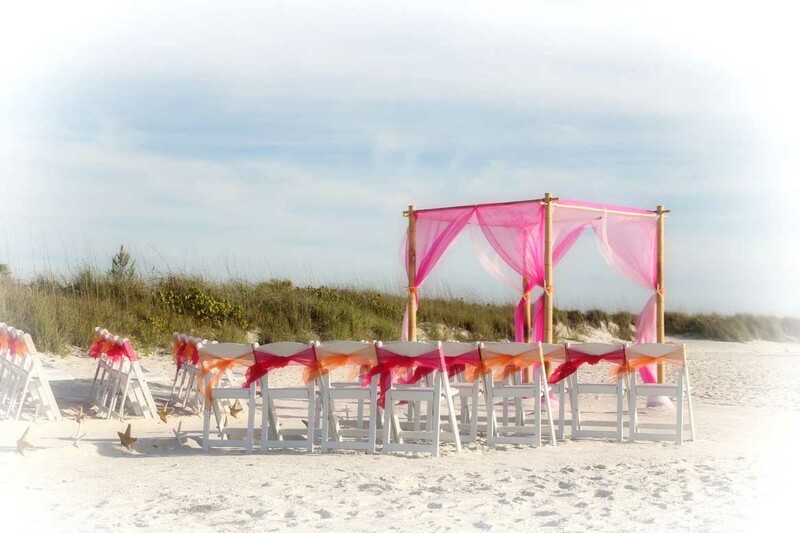 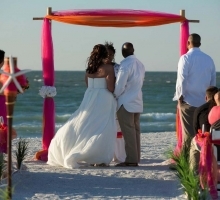 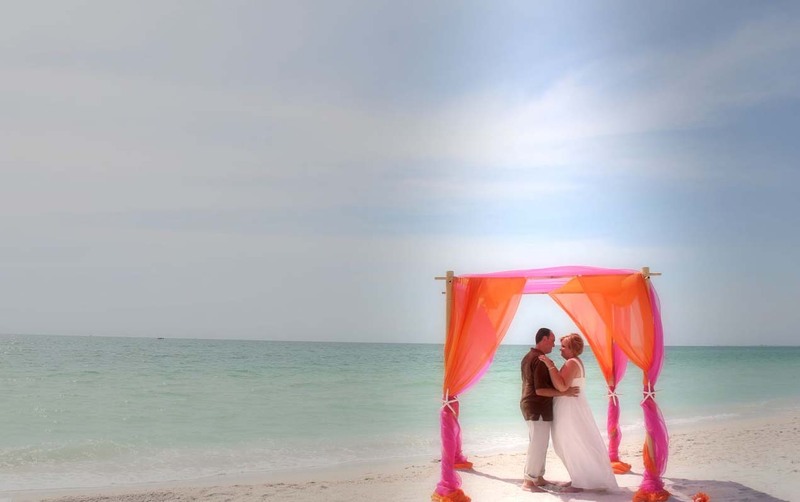 Florida beach wedding magic happens when chiffon drapes and accents combine - sashes on the tiki, starfish and flowers, colored, vibrant sands to blend, beads and gems scattered at the table and even a customized cake for your beach-side reception. 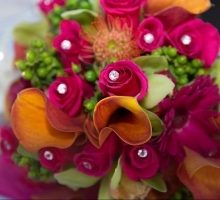 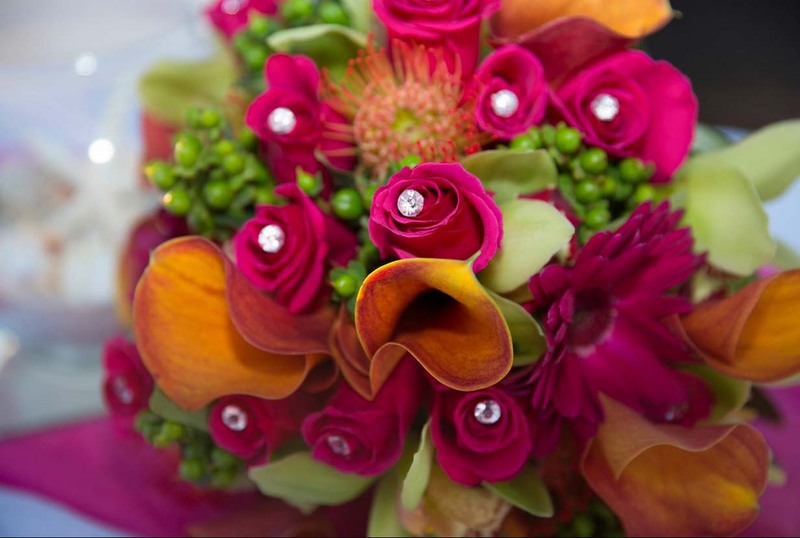 Stunning and memorable, this orange and fuschia thrill is thoroughly modern and breathtakingly beautiful. 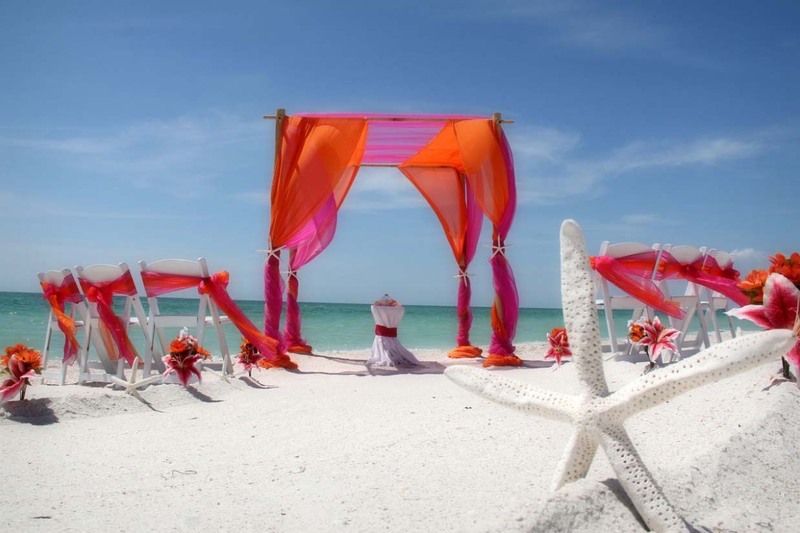 Florida beaches lend themselves to all kinds of colors and textures and in such a naturally lovely setting it can be a choice of blending in or standing out. 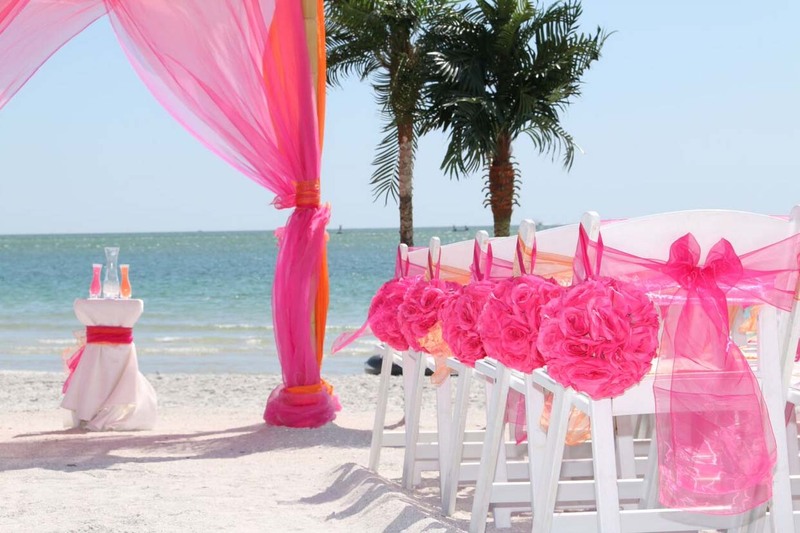 This color combination offers the full range of choice - from bright accents which draw the eye and add a flash of color - to bright, colorful chiffon drapes and a unique, romantic ceremony to delight your senses! 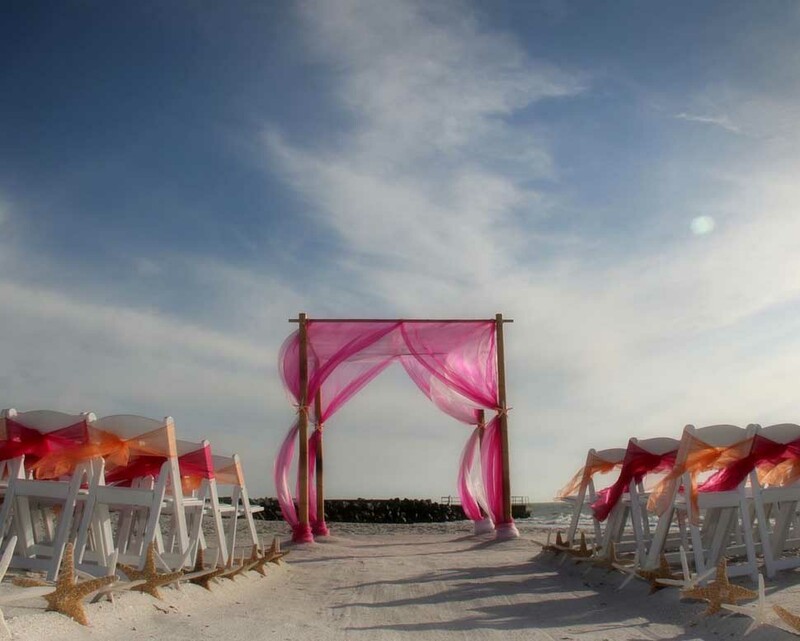 Let our gallery inspire you ... mix and match along the aisle, the chairs and the arch. 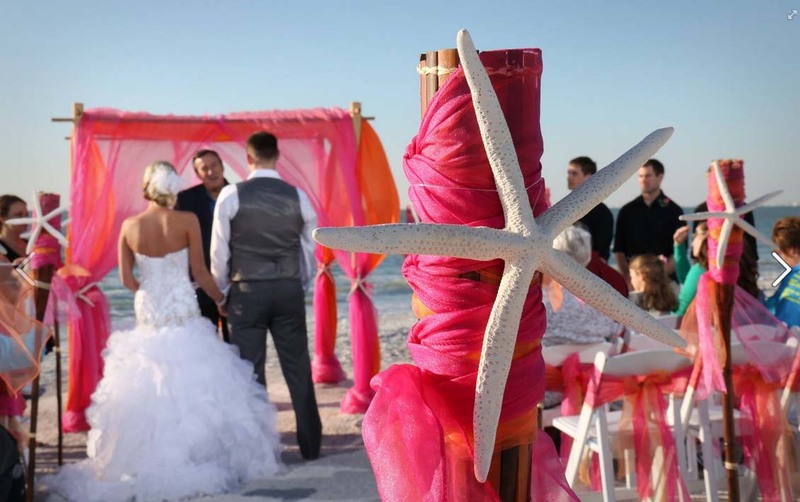 Accent with white starfish to highlight the bold colors even more .... or blend in stargazer lilies to enhance the colors and bring fresh florals in the same color family. 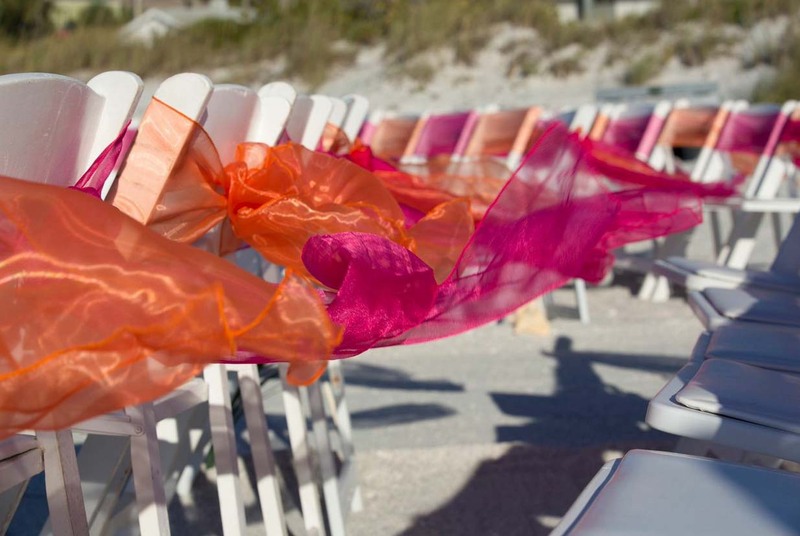 If you're looking for a bold style statement and thought you already had a favorite - dive into our Orange and Fuschia Thrill and prepare to be swayed!